Despite their twin positions as two of North America’s most iconic Italian neighborhoods, South Philly and Toronto’s Little Italy have functioned in dramatically different ways since World War II. Inviting readers into the churches, homes, and businesses at the heart of these communities, Staying Italian reveals that daily experience in each enclave created two distinct, yet still Italian, ethnicities. 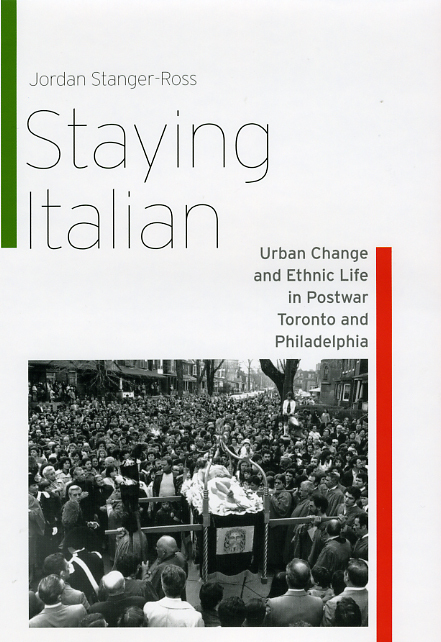 As Philadelphia struggled with deindustrialization, Jordan Stanger-Ross shows, Italian ethnicity in South Philly remained closely linked with preserving turf and marking boundaries. Toronto’s thriving Little Italy, on the other hand, drew Italians together from across the wider region. These distinctive ethnic enclaves, Stanger-Ross argues, were shaped by each city’s response to suburbanization, segregation, and economic restructuring. By situating malleable ethnic bonds in the context of political economy and racial dynamics, he offers a fresh perspective on the potential of local environments to shape individual identities and social experience.